A beautiful morning for walking, though I’m sure even by 9am, I’d missed the best of the day! I took the bridle way to Pilton, along the old line of the railway that once served the ironstone quarries. The dog particularly loves this route, as she can wander off the lead, and there are lots of good smells. For me, it was the sounds that made this morning’s walk: the green cornfields were full of LBJs, which is what I believe bird-watchers call non-descript Little Brown Jobs. While they were, for the most part, invisible, their song was extraordinary, and though I’m no expert, I’m sure there was at least one lark in the mix. 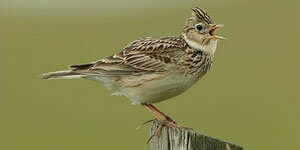 The RSPB’s website, with its identifyer options, is helpful, and I’m sure their lark recording matched one of the songs that I heard.